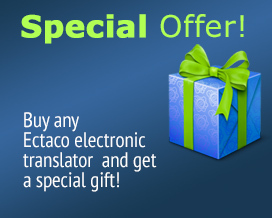 Raising the bar on smartphones, the ECTACO Multi 11 language SpeechGuard TLX is the perfect tool for a world traveler, language learner, or someone who just needs a superior, rugged Smartphone. The entire system is based on years of research & modeled after the original SpeechGuard, which was used by US Armed Forces during the second Gulf War. With the ability to receive FREE incoming calls in over 135 countries with NO CONTRACT it's easy to stay in touch with friends and family when you travel. Loaded with everything you need for making sense of your world in a foreign land, the SpeechGuard comes with a voice translator, picture translation, travel information, voice recognition and a Language Teacher to name very select few. It's even been called the "Panasonic Toughbook" of the smartphone world! Raising the bar on smartphones, the ECTACO Multi 8 SpeechGuard TLX for Russian speakers is the perfect tool for a world traveler, language learner, or someone who just needs a superior, rugged Smartphone. The entire system is based on years of research & modeled after the original SpeechGuard, which was used by US Armed Forces during the second Gulf War. With the ability to receive FREE incoming calls in over 135 countries with NO CONTRACT it's easy to stay in touch with friends and family when you travel. Loaded with everything you need for making sense of your world in a foreign land, the SpeechGuard comes with a voice translator, picture translation, travel information, voice recognition and a Language Teacher to name very select few. It's even been called the "Panasonic Toughbook" of the smartphone world! 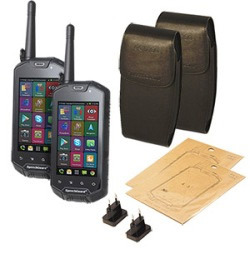 Raising the bar on smartphones, the ECTACO Multi 14 language SpeechGuard TLX is the perfect tool for a world traveler, language learner, or someone who just needs a superior, rugged Smartphone. The entire system is based on years of research & modeled after the original SpeechGuard, which was used by US Armed Forces during the second Gulf War. With the ability to receive FREE incoming calls in over 135 countries with NO CONTRACT it's easy to stay in touch with friends and family when you travel. Loaded with everything you need for making sense of your world in a foreign land, the SpeechGuard comes with a voice translator, picture translation, travel information, voice recognition and a Language Teacher to name very select few. It's even been called the "Panasonic Toughbook" of the smartphone world!